The Flying Duck01943 609587work Public HouseBuilt In 1709: Many Original Features. 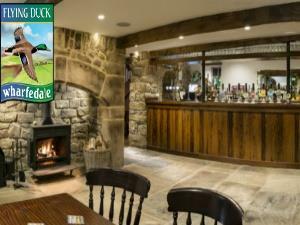 The pub retains many of its original features including York stone and oak wooden floors, beamed ceilings, exposed stone walls and real fire places. Between the pub and the brewery is a decked beer garden. Real Ales, Ciders, Lagers & Wines. The Flying Duck serves nine cask real ales, real ciders, continental lagers, a wide selection of bottled beers from around the world, an extensive range of fine wines, whiskies and spirits, soft drinks, teas and coffees. Built In 1709: Many Original Features.